It's not often I get into Zara but last week I had a meeting in town so I took the opportunity to nip in for a look. 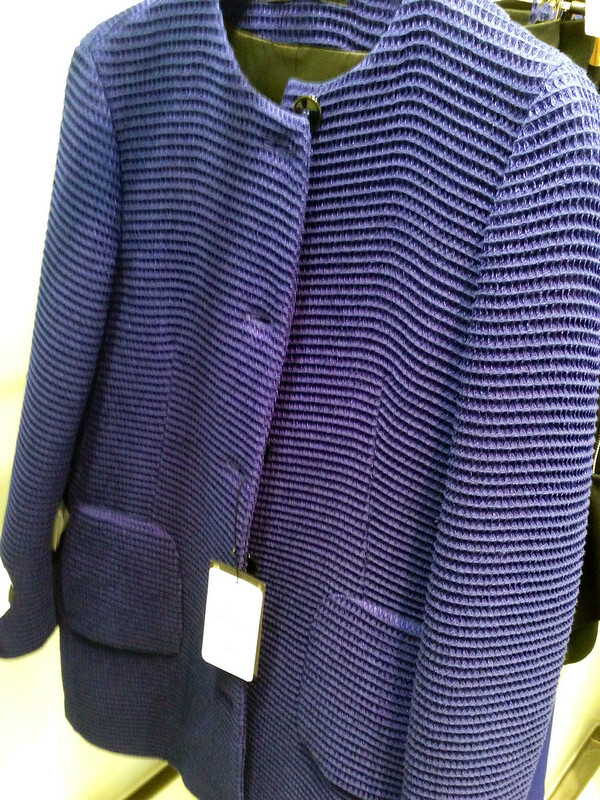 I have found Zara a bit hit and miss in recent seasons but there is so much in there at the moment - seriously tempting. 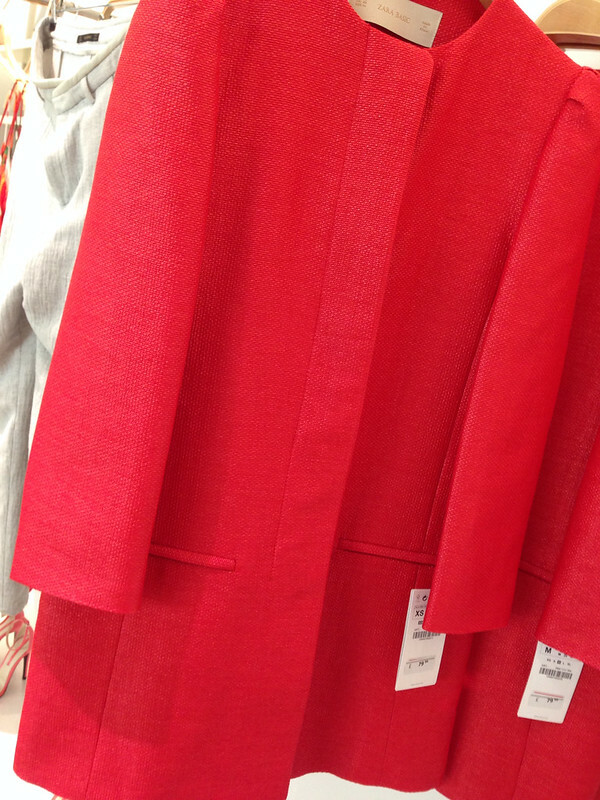 One trend that was noticeable all over the store was the statement coat...and I do love a nice bright statement coat! And here's the one that I tried on and that about 60 of you urged me to buy when I shared the pictures on social media! I didn't buy at the time but my friend was in the next day and she bought it on my behalf when she saw my size was still there. I'm mulling over it and as my friend is away until after Easter, I don't have to decide just yet. Is a statement coat a wise buy for a busy mum's wardrobe? If I pay £100 for a coat, I want to get lots of wear from it but surely if I wear it more than 5 or 6 times on this blog, you're going to get bored of seeing it? And if I wear anything 5 times on the blog, I wear it at least twice as much in real life. Could it be a case of 'here comes Avril in her yellow coat AGAIN'? So a decision will be made next week! In the meantime, let me know what you think...a beautiful statement piece or something I'll be bored of by September? I love it on you and your friend :) I say go for it! I have a statement mac. I have worn it once in 4 years. It's BRIGHT ORANGE and I feel silly wearing it - I should wear it because it's gorgeous but feel it's such a statement I can't wear it TOO often. If that makes sense? 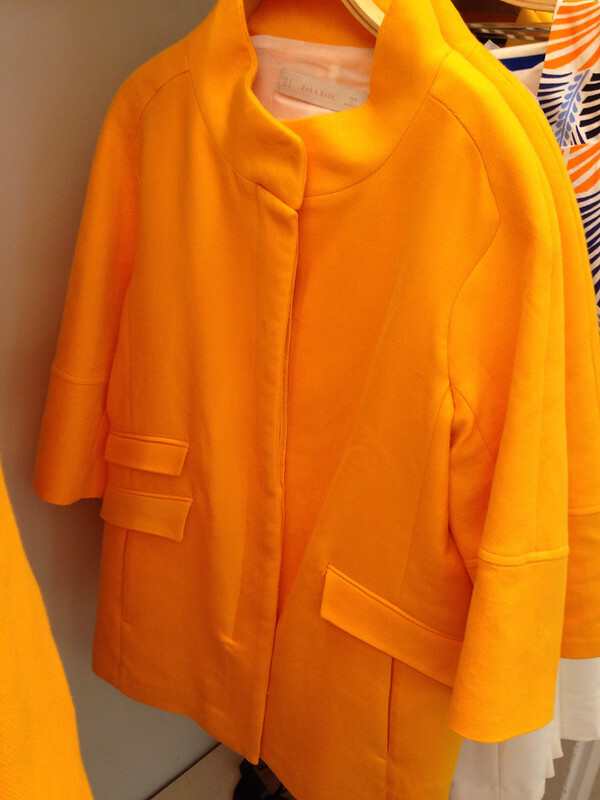 I was in town shopping yesterday and saw about 6 people wearing that yellow Zara coat - so think it's very popular. It is lovely, I'm a big fan of that yellow. My friend has it and wears it with hit pink heels. It looks fab! 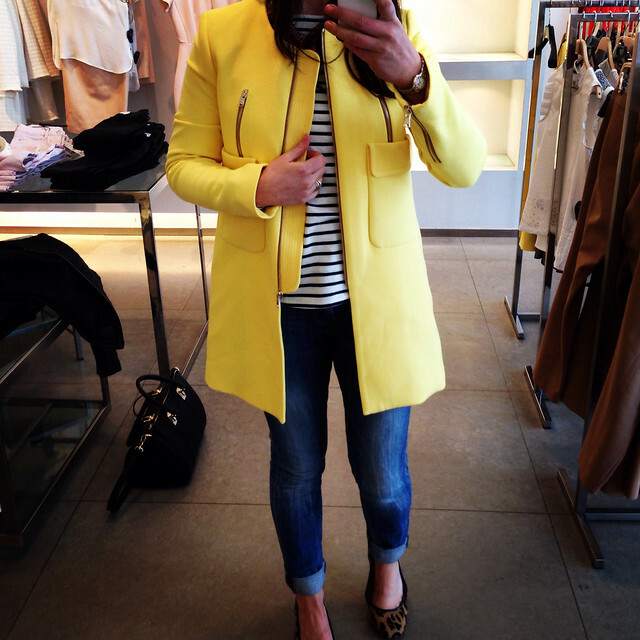 I was in town shopping yesterday and saw about 6 people wearing that yellow Zara coat - so think it's very popular. It is lovely, I'm a big fan of that yellow. My friend has it and wears it with hot pink heels. It looks fab! I have to say, it looks really good on you. I understand all your reservations but if you love it enough, I think you would have snapped it up by now and not worried about it. Sometimes you have to go with a gut instinct. And something still seems to be holding you back. 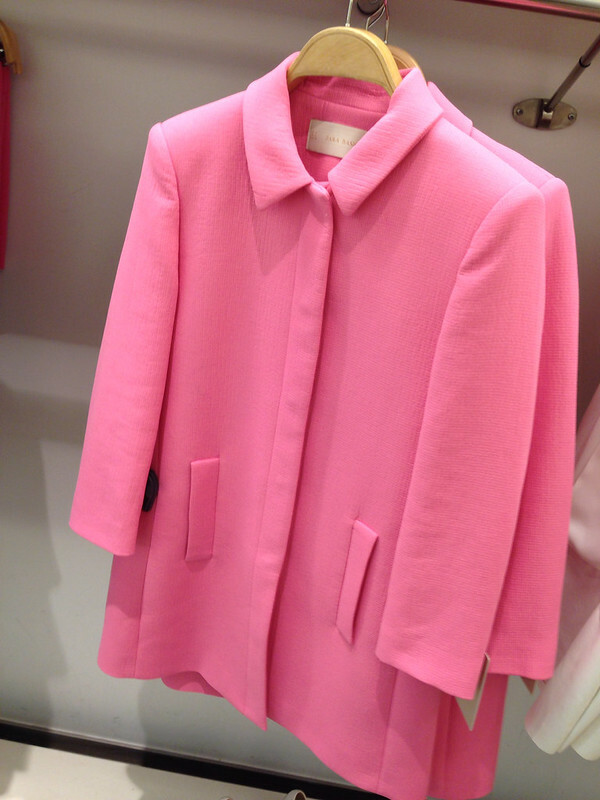 I bought a fuchsia coat years ago and it was the scariest thing I ever owned but I had to have it and credit to it .. I still have it. Maybe you love it ... but not enough? Hi, I think the coat looks amazing, especially with jeans and a Breton. I think you have to be a statement coat lover or they are hard to wear. I love my statements coats. Most of mine are bright or patterned. I think they always make an outfit, and I love them! I think you have to be 100 per cent sure for something like this but I have to say I think it looks beyond fabulous on you and you should keep it! You can style it lots of different ways so you don't get bored of it! Would look great over a monochrome outfit! I bought one in bright green and have to say it looks great with jeans and makes you feel wide awake in the morning. However I did see 2 other women in it who were about 10 years younger and it looked like a blanket on them so maybe it makes you feel better than it actually looks! I agree with Sue. If you love it, you'd have made up your mind by now. I also agree with IwontwearSludgeBrown about buying something just to scratch that itch...and then after a couple of weeks or so returning it because you didn't, after all, love it that much. I do this at least 50% of the time (I am an avid returnee!) but it does help make up my mind, rather than waste time with shall I or shan't I. Also, the fact that someone else commented on seeing at least six people in it, one day out, would put me off a little. If I were you, I would look at Zara's yellow jackets - still gorgeous with your breton and leopard print shoes, still lovely on you - but somehow more subtle and wearable. And probably a bit cheaper too. Hi Avril, I do think it looks great on you but would advise purchasing if it was the same colour but a more classic style. I hope you went for it, it looks gorgeous ! I have a similar one, and I feel like there's so many ways to wear it. My current fave is with simple jeans, a grey cashmere sweater and a burgundy bag, as in the post linked below. I don't seem to get tired of it !